The Half-Life 2 soundtrack was composed by Kelly Bailey. It is an amalgamation of newly-composed music and several cues from Bailey's previous work on Half-Life. Most, if not all, of the tracks were named by Marc Laidlaw. The limited edition Half-Life 2 "Gold" package included, among other exclusive extras, a CD soundtrack. Although the CD contains several exclusive tracks, it does not include all of the music heard in the game. Using an appropriate program, it is possible to extract all audio tracks heard in-game from the hl2_sound_misc_dir.vpk archive file. The soundtrack (save the CD versions of tracks 1 and 34) was also included in the game directory of both the full and demo Audiosurf releases on Steam as part of Audiosurf's The Orange Box Soundtrack. On September 24, 2014, the soundtrack was made available as free DLC to all owners of the game on Steam. * = not present on the Half-Life 2 Original Soundtrack CD. ** = not present in Half-Life 2 game files. 01 ** Hazardous Environments (long version) Half-Life13.mp3 1:23 Does not appear in the retail game This track features the "Smashing 2" audio sample included in the album Cuckooland Ambience of Zero-G's Altered States sample library. This is the Valve Corporation theme song, the beginning of which is played during the Valve logo movie in all Valve games. This track appears in its complete form in Half-Life during the chapter Surface Tension. In Half-Life 2, only the edited versions in the opening logo and "Hazardous Environments (short version)" are heard, though the complete track is on the original soundtrack CD. This is the same track as "Valve Theme (Long Version)" from Half-Life. * 05 Hazardous Environments (short version) HL1_song11.mp3 0:35 A Red Letter Day: when Gordon puts on the HEV suit in Dr. Kleiner's lab. This is a shorter edit of "Hazardous Environments," the Valve Theme, removing the first few seconds of the long version, concluding before further percussion can begin. 02 10 CP Violation HL2_song20_submix0.mp3 1:43 Route Kanal: Early in the level in a train tunnel that has the player moving through side passages. "CP Violation" is a double entendre, referring to both Civil Protection and the eponymous physics term. * 13 CP Violation (remix) HL2_song20_submix4.mp3 2:20 Route Kanal: Upon leaving the pool with a mixer in it, where Civil Protection rolls explosive barrels at the player. This track was used in the 2004 Half-Life 2 trailer. On console versions of The Orange Box, this is played when highlighting Half-Life 2 on the menu. See "Beam Me Up" for more information on the name. 04 48 Brane Scan HL2_song31.mp3 1:41 Anticitizen One: Leading up to the fight in the plaza containing the Combine generator. 05 27, 62 Dark Energy HL2_song3.mp3 1:33 Highway 17: Played when leaving Shorepoint Base. Credits: Played during the first section. The very ending contains a snippet of "Highway 17." 06 24 Requiem For Ravenholm Ravenholm_1.mp3 0:33 "We Don't Go To Ravenholm...": After passing through the gate at the end of the courtyard and Father Grigori bids farewell, the song plays. The "Ravenholm Reprise" track, only shortened and centering around a loud guitar wail. 07 ** Pulse Phase (OST mix) HL2_song5.mp3 1:07 Does not appear in the retail game This version appears in the original soundtrack CD and in AudioSurf, as well as the 2003 Half-Life 2 leak, but not in the retail version of the game. This is the in-game version of the track, which is the looped version played four times in a row. ** ** Pulse Phase (loop) HL2_song6.wav 0:11 Does not appear in the retail game This version only appears in the leak. 08 23 Ravenholm Reprise HL2_song7.mp3 0:50 "We Don't Go To Ravenholm...": Starts playing as soon as the level begins. 09 16 Probably Not a Problem HL2_song33.mp3 1:24 Route Kanal: During the Headcrab shelling around the toxic water, before getting the airboat. The track's title may be referencing a quote from Half-Life where a scientist mentions the anti-mass spectrometer reaching 105 percent, who adds it's probably not a problem but notices a small discrepancy. 11 28 Slow Light HL2_song32.mp3 0:45 Highway 17: Plays after the Gunship in New Little Odessa has been defeated. 13 54 Hunter Down HL2_song28.mp3 0:13 "Follow Freeman! ": Played immediately after the last Strider is killed. 15 * Miscount Detected HL2_song25_Teleport.mp3 0:48 Does not appear in the retail game Appears in the game files, AudioSurf, and the original soundtrack CD, but nowhere in-game. It was supposed to play during the aborted teleport sequence in "A Red Letter Day". 16 ** Headhumper HL2_song24_Lamar.mp3 0:08 Does not appear in the retail game A bonus track on the original soundtrack CD and in AudioSurf. Was originally supposed to play when the player is ambushed by a Headcrab while exploring a zombie-infested shack during Water Hazard. 17 26 Triage at Dawn HL2_song23_SuitSong3.mp3 0:45 "We Don't Go To Ravenholm...": At Shorepoint Base, when the battle in the garage is over. The name is a reference to the the very situation the player finds himself at the point it is played - Triage of Winston at dawn break. 18 ** Combine Harvester HL2_song22_CombineTheme3.mp3 1:23 Does not appear in the retail game A bonus track on the original soundtrack CD and AudioSurf. Was originally supposed to play somewhere in the Citadel. The title is a reference to the combine harvester, a farming machine that harvests grain crops. 19 30, 41 Lab Practicum HL2_song2.mp3 2:52 Highway 17: Under the train bridge. Entanglement: After exiting the teporter in Dr. Kleiner's lab, just before the beginning of Anticitizen One. A longer version of "Shadows Fore and Aft" without the extra sound effects. 20 37 Nova Prospekt HL2_song19.mp3 1:55 Nova Prospekt: When the player initially enters the prison. A subtle refrain from "CP Violation" can be heard at 1:00 for around twenty seconds before dropping to a more dramatic outro. 21 15 Broken Symmetry HL2_song17.mp3 1:03 Route Kanal: Upon leaving the sewers. 22 53 LG Orbifold HL2_song16.mp3 2:52 "Follow Freeman! ": When the player and other citizens go underground and fight Combine soldiers during the Uprising. 23 51 Kaon HL2_song15.mp3 1:11 "Follow Freeman! ": When fighting the Combine Gunship over the Overwatch Nexus. 24 19 You're Not Supposed to Be Here HL2_song14.mp3 2:41 Water Hazard: After receiving the mounted gun for the Airboat. The title is a reference to a line the G-Man said to the player in a cut training level of Half-Life 2 that can be found in the Half-Life 2 leak. The G-Man uses the line again, this time directed at Alyx, in a trailer for Half-Life 2: Episode Two. 25 44 Suppression Field HL2_song13.mp3 0:56 Anticitizen One: While meeting your first rebel squad member of the chapter in the playground. 26 45, 46 Hard Fought (long) HL2_song12_long.mp3 HL2_song12d.mp3 1:13 Anticitizen One: Played twice in a row: first when assaulting a Civil Protection barricade, and then during the underground shootout while waiting for a hole to be blown open by a rebel. Several versions of this track exist, including an early version from the Half-Life 2 leak and a short version. This version is the one used in the retail game. This track features the "Wooaauh" audio sample included in the album Dream Zone of Zero-G's Altered States sample library. This track also appears in the Half-Life 2: Episode One trailer. * ** Hard Fought (short) HL2_song12_short.mp3 HL2_song12c.mp3 0:44 Does not appear in the retail game This version only appears in AudioSurf and the Half-Life 2 leak. * ** Hard Fought (early version) HL2_song12.mp3 0:44 Does not appear in the retail game This version only appears the Half-Life 2 leak. Also known as 31_39_01.AIF. 27 25 Particle Ghost HL2_song1.mp3 1:38 "We Don't Go To Ravenholm...": Kicks in upon leaving the Ravenholm Mines and heading into the snipers' nests outside, right before the Fast Zombie appears. 28 01 Shadows Fore and Aft HL2_intro.mp3 1:25 Point Insertion: During the G-Man's speech at the start of the game. This is shorter version of "Lab Practicum" with added sound effects. The whirring of Manhack blades and Kleiner's teleport can be heard in the background. 29 55 Neutrino Trap HL1_song9.mp3 1:35 Our Benefactors: Upon exiting the sewer tunnel at the base of the Citadel. This is the same track as "Hurricane Strings" from Half-Life. 30 11 Zero Point Energy Field HL1_song6.mp3 1:42 Route Kanal: When first entering the sewers after the Hunter-Chopper first attacks. This track features the "Frost" audio sample included in Zero-G's album ProSamples Vol. 9: Future Beats 2. This is the same track as "Cavern Ambiance" from Half-Life. This track features the "Deep Sea Atmos", "The Deep", and "Ominous Sea Cave" audio samples included in the Ambient albums of Zero-G's Altered States sample library. This is the same track as "Space Ocean" from Half-Life. 32 22 Black Mesa Inbound HL1_song3.mp3 2:14 Black Mesa East: The scrapyard where you first receive the Gravity Gun and meet Dog. The name is derived from the first level of Half-Life, in which the player is making his way to the Anomalous Materials Lab. This track features the "Cosmic Drone" audio sample included in the album Malice In Wonderland of Zero-G's Altered States sample library. This is the same track as "Vague Voices" from Half-Life. 33 60 Xen Relay HL1_song26.mp3 0:40 Dark Energy: Upon reaching the top of the Citadel, just before meeting Dr. Breen. This is the same track as "Threatening Short" from Half-Life. 34 ** Tracking Device (OST mix) HL1_song25.mp3 1:03 Does not appear in the retail game This is a remix of "Credits/Closing Theme" from Half-Life. This version only appears on the original soundtrack CD. * 63 Tracking Device (game mix) HL1_song25_REMIX3.mp3 1:01 Credits: Played during the second section. This version only appears in the Half-Life 2 game files and Audiosurf. 35 41 Singularity HL1_song24.mp3 1:19 Entanglement: When viewing the Nova Prospekt teleport. This track features the "UFO" audio sample included in the album Dream Zone of Zero-G's Altered States sample library. This is the same track as "Traveling Through Limbo" from Half-Life. 36 40 Dirac Shore HL1_song21.mp3 1:27 Entanglement: When entering the flooded basement. Its name is a play on the physics term Dirac Sea. This is the same track as "Dimensionless Deepness" from Half-Life. 37 21 Escape Array HL1_song20.mp3 1:27 Black Mesa East: At the start of the level, right after the loading screen. This is the same track as "Electric Guitar Ambiance" from Half-Life. 38 58 Negative Pressure HL1_song19.mp3 1:58 Our Benefactors: At the beginning of Dr. Breen's speech: "You have destroyed so much. What is it exactly that you have created?" This is the same track as "Steam In The Pipes" from Half-Life. This track also appears in Half-Life 2: Episode One. 39 29 Tau-9 HL1_song17.mp3 2:06 Highway 17: When first reaching the crane. This is the same track as "Drums and Riffs" from Half-Life. 40 33 Something Secret Steers Us HL1_song15.mp3 2:03 Sandtraps: At Lighthouse Point during the Dropship attack. This is the same track as "Nuclear Mission Jam" from Half-Life. The title is a reference to a sentence said by the All-Knowing Vortigaunt. 41 49 Triple Entanglement HL1_song14.mp3 1:32 Anticitizen One: Upon entering the Zombie infested sewers near the end of the chapter. This is a remix of "Sirens in the Distance" from Half-Life. 42 ** Biozeminade Fragment HL1_song13.mp3 0:32 Does not appear in the retail game A bonus track on the original soundtrack CD, though it does not appear in the retail game files or AudioSurf. This track features the "Deep Guts" audio sample included in the album Cuckooland Unhinged of Zero-G's Altered States sample library. This is a remix of "Alien Shock" from Half-Life. 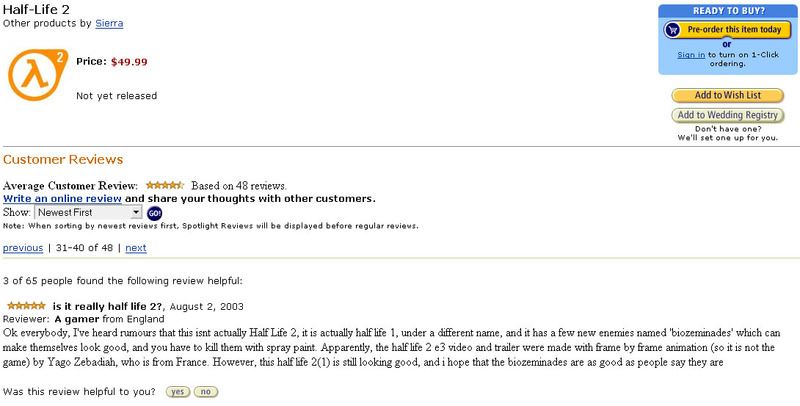 The name is an homage to an early Amazon.com joke review for Half-Life 2 in which a fan claimed the game had Biozeminades in it. 43 18 Lambda Core HL1_song10.mp3 1:45 Water Hazard: When fleeing from the second Hunter-Chopper while driving through large cement pipes. This track features the "Beat 17A", "Beat 17B", "Beat 19A", and "Beat 19B" audio samples included in Sony's Methods of Mayhem: Industrial Toolkit sample album. This is the same track as "Diabolical Adrenaline Guitar" from Half-Life. * 38 Entanglement HL2_song0.mp3 0:39 Nova Prospekt: Upon entering the Combine Wall crushing canyon at end of chapter, just before meeting Alyx. This track only appears in the Half-Life 2 game files. * 09 Entanglement (loop) HL2_ambient_1.wav 0:08 Route Kanal: When exiting the first underground section, before climbing on top of the moving train. This track only appears in the Half-Life 2 game files. Was originally only in the leak until the June 2013 SteamPipe update. It is the only track to play as an ambient sound. * 32 Highway 17 HL2_song8.mp3 0:59 Sandtraps: At the house by the coast where Combine soldiers are burning bodies. This song is actually the looped version played four times in a row. * ** Highway 17 (loop) HL2_song8.wav 0:15 Does not appear in the retail game This version only appears in the leak. * 04 A Red Letter Day HL2_song10.mp3 0:29 "A Red Letter Day": When entering Dr. Kleiner's lab. This track features the "Jungle Fire" audio sample included in the album Cuckooland Ambience of Zero-G's Altered States sample library. * 31 Sandtraps HL2_song11.mp3 0:34 Sandtraps: At the zombie-infested area of the tunnels. Also known by the filename 31_56_01.AIF. Was originally supposed to have an earlier appearance in Route Kanal, during the first Barnacle encounter, right before Civil Protection executes a group of rebels. This track features the "Bamboo" audio sample included in the Ambient albums of Zero-G's Altered States sample library. * 02 Train Station 1 HL2_song26_trainstation1.mp3 1:30 Point Insertion: When entering the outdoor plaza with the Breencast. This track features the "Dungeon Trampoline" audio sample included in the album Cuckooland Ambience of Zero-G's Altered States sample library. * 43 Radio radio1.mp3 0:39 Anticitizen One: When entering the room adjacent to the closet with the TV showing the G-Man. This track features the "Distorted Trumpets" and the "Is That The Door?" audio samples included in the album Cuckooland Ghost In The Machine of Zero-G's Altered States sample library. This track also appears in Half-Life 2: Episode Two. * 59 Industrial Suspense 2 industrial_suspense2.wav 0:11 Our Benefactors: After Dr. Breen's "laying the foundation for humanity" speech and jumping down, before the Strider battle. * 39 Apprehensive Short HL1_stinger_song7.mp3 0:23 Entanglement: When Eli's Combine pod opens up at the window with Alyx and the player. This track also appears in Half-Life. * 08 Bass String Short HL1_stinger_song8.mp3 0:09 Route Kanal: When Civil Protection is beating up the couple, right before the player gets the pistol. This track also appears in Half-Life. * 34 Scared Confusion Short HL1_stinger_song16.mp3 0:16 Sandtraps: Right before the Antlion Guard battle outside the Vortigaunt camp. This track also appears in Half-Life. * 14 Dark Piano Short HL1_stinger_song27.mp3 0:17 Route Kanal: When entering the room full of explosive barrels and Manhacks. This track features the "Escaped for Now" audio sample included in GMP Music's In The Shadows sample album. It also appears in Half-Life. This track also appears in Half-Life as well as the Half-Life 2: Episode One trailer. ↑ An entry for hl2_song22_combineTheme3 appears in level_sounds_citadel.txt.